Sometimes, some of our favorite, precious oil blends are just too easy to DIY. Whether we do or don’t DIY depends on our patience (looking at myself); availability of necessary ingredients; appreciation for beautiful, branded goods; or some other personal nuance that makes us either excited to do a little mixing or totally turned off. Regardless of where you are on the DIY spectrum, I think it’s safe to say that many green beauty connoisseurs are looking for sophisticated ingredients to target their main skincare concerns and charming brand stories when they are ready to throw down some major money for a magical potion. But when it comes to simple moisture in a pared-down routine? A blend of beautiful carrier oils and essential oils will do. Sure, they may not be the fanciest carriers out there, but if your main concerns are 1) moisture and 2) budget, there’s nothing better than a mix of luscious oils that can easily be used from head to toe. 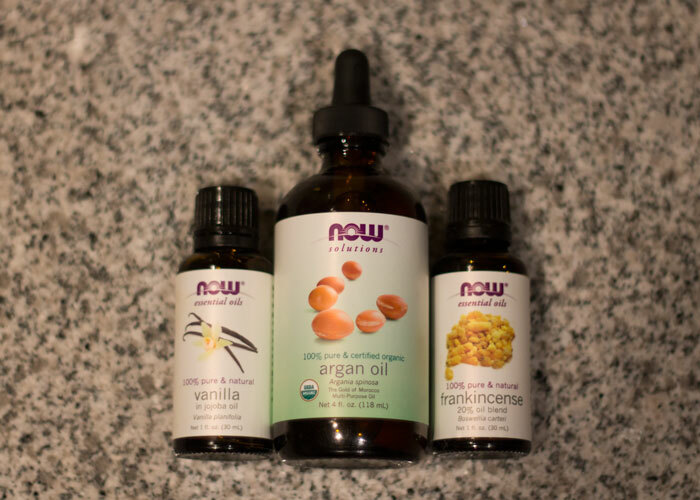 As you’ll notice in the photo below, I chose to share my stock of organic argan oil (not mentioned in the ingredients list) and two essential oils that I love: vanilla and frankincense. Be mindful when DIYing and/or straying from a recipe, though; essential oils are powerful, and you need to know how your skin will react. Always patch test! With that said, please enjoy this excerpt from Natural Beauty Alchemy. In a pinch, you can create a wonderful evening oil to heal your skin. Note: This is a not a series of sponsored posts. This book is wonderful, and I found the recipes approachable. I reached out to the publicist to get permission to share these recipes with you because I thought you’d enjoy them as much as I do! This “potion” indeed works like magic. It fights wrinkles, nourishes skin, and leaves a velvety touch in the morning. While avocado oil is rich in vitamin E and essential fatty acids, evening primrose oil is a powerful anti-aging ingredient that fights wrinkles. Their efficacy is made complete with the addition of pomegranate seed oil, which provides a surge of antioxidants that protect from sun damage and promote youthful-looking skin. Grapefruit or tangerine essential oil transforms the application of this potion into a pleasurable moment. The essential oils may be photosensitizing, however, so daily use of sunblock is strongly recommended. 1. Mix the above ingredients in their listed order and transfer to a glass bottle with a dropper. 2. Make sure your face is clean, with no makeup residue, and still moist after cleansing or washing. Rub a few drops of this potion between your palms and pat your face and neck. Do not rinse. 3. Use every evening at bedtime. Store the bottle away from heat and light. 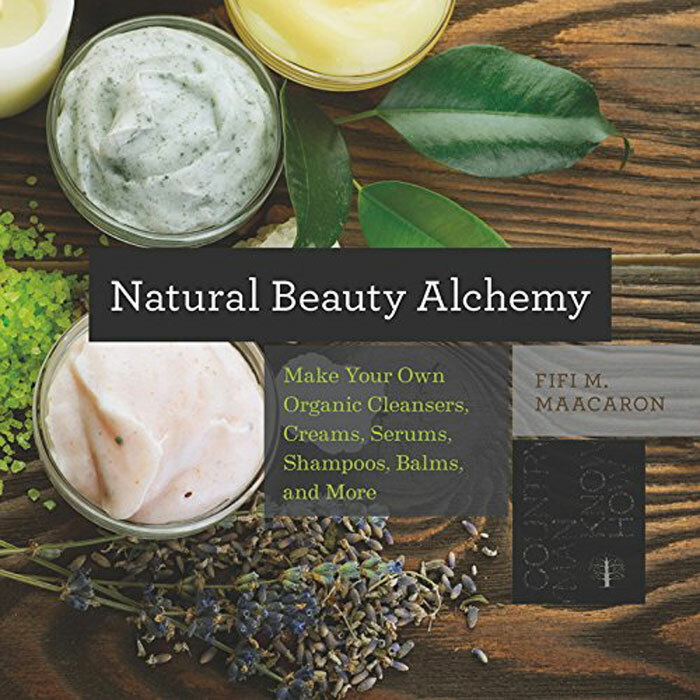 Excerpted from Natural Beauty Alchemy Copyright © 2015 by Fifi M. Maacaron and published by W.W. Norton & Company Inc. Used by permission of the publisher. All rights reserved.